Updating my watched tags, I wanted to watch python-3.6 tag, and I was already watching python and python-3.x tags. However when I add the tag, I see it added and then it quickly switches to python-3.x, and stay next to the real one. It will also point to the same URL and it seems I can indefinitely add other ones this way. 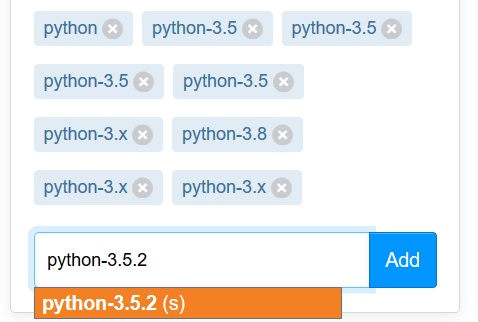 I also noticed the same issue with python-3.7 but not with python-3.8, or 3.1, 2, 3, 4, 5. In a bit different way the python-3.5.2 has also specific issues: it displays "s" as the number of watchers, I don't know if it's a default value or a weird bug. And when I add it to my watched tags it it switches to only python-3.5 and points to the same URL. Same thing, I can indefinitely add other ones like this. Upon refresh, all the duplicates are gone, leaving the true ones only, and so I'm not able to watch the "infected" ones. A screenshot showing the unlimited duplicates and the "s" amount of python-3.5.2 watchers. This is an issue for me as I would like to watch some of these tags (python-3.6 notably). I don't know if same issues occur for python2-... and haven't tried specifying Y in python-3.X.Y.